The news that Comstock Resources was renewing its efforts to drill the Haynesville Shale led to some subdued excitement, including a front page article in the Shreveport Times a couple of weeks ago suggesting that the Haynesville might be making a comeback. Comstock's strategic move was made in response to the cratering of oil, and to a lesser degree natural gas, prices. But that same energy price climate has led BHP Billiton, which owns Petrohawk, to slash its U.S. shale budgets for 2015 (specific budgets will be released in February) and concentrate its efforts on the Eagle Ford Shale. The company's U.S. rig count will drop from 26 to 16 by year end 2015, and its Haynesville Shale rig count will drop to one. 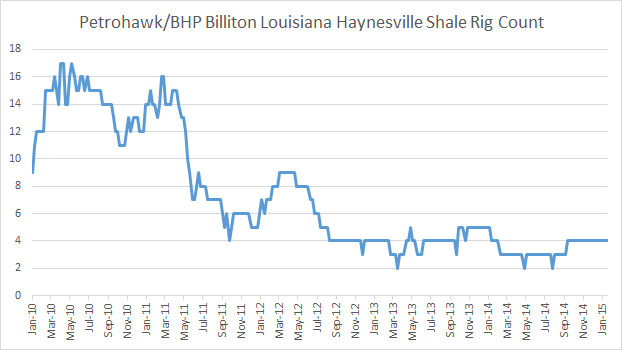 Currently, BHP is running four rigs in the Haynesville, having reached a peak count of 17 in mid-2010. This announcement likely will not be the last of its kind as E&P companies rejigger their strategies to address an energy market with few, if any, bright spots. While BHP is chasing liquids with its concentration on the Eagle Ford, the liquids market is not the safe bet it was last year at this time. Each company has its own sweet spots based on its acreage portfolio or its 2015 price hedges, but I have to believe some companies are S.O.L. and are panicking. In the first five years of its development, Haynesville acreage was sacrosanct and was seldom sold, but I think we have come to the point where more Haynesville acreage will be on the market and we will see deals among independents where companies that are narrowing their strategic and geographic focus (i.e. SM Energy). Also look for private equity-backed companies to step up and start stockpiling good acreage to produce (or re-sell) at a later date. Heck, we might even see the return of Aubrey McClendon.